Stock N Lock is delighted to appear in the Worcester News again, we’re on page 3 of today’s edition. We think our roundabout signage is great, how about you? 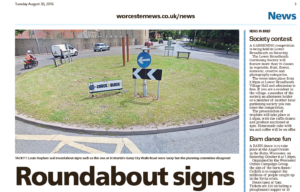 Do you need to store your roundabout sign? If so we’re available 7 days a week.